With the approach of the school year, many daughters will begin their education all over again as college freshman, many of them will leave home for the first time, bound for college. 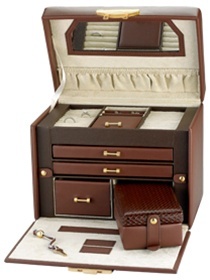 A unique and personal, as well as practical, going-away gift is a jewelry case. There are three equally important considerations in determining which type and style to give. The first is transportability. The jewelry box should be large enough to handle rings, earrings, bracelets, and necklaces, and small enough to fit easily into travel luggage. Finally, it should be unobtrusive in a small dorm room. The second important selection aspect is durability. Sturdy hinges and clasps are critical. While wood connotes the most luxurious jewelry boxes, in this instance, you should consider plastic covered by a sturdy leather or faux leather that is scratch and water-resistant. The final aspect is security. This means a robust lock combined with the durable structure. Almost all travel cases have a lock, as do most non-travel cases. If you choose a case not specifically designed for travel, though, be sure that all drawers and opening tops lock. Styles can vary, with the central feature being whether it has a handle. These are typical of travel cases where constant movement is expected (overnight/weekend stays), and can be practical in extended stays as well, especially if the case is to be stored in a drawer or under a dorm-room bed and needs to be routinely moved. When you purchase a jewelry box as a going-away-to-college gift, don’t forget a nameplate with a personalized message, to help her stay close to you while she’s away!